That was some of the best flying I've seen to date — right up to the part where you got killed. Take to the skies in this 10 Minute Dive In of Fractal Phases' Sky Rogue. 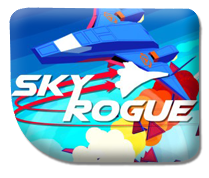 3D aerial combat with an aesthetic that wouldn't be out of place in your local arcade in 1995, rouge-lite gameplay, procedurally generated maps, random missions and unlockables make Sky Rogue something new to play on your Nintendo Switch.